The Samsung Galaxy Core Advance has been officially announced, bringing a big screen to the budget end of the mobile market. While the "Advance" extension to the handset's name may intrigue you, there's been little added to the original Galaxy Core which arrived in May 2013. The main difference is the screen size, up from 4.3-inches to 4.7-inches on the Core Advance, although it still slums it with the same 480 x 800 resolution, which we can only assume will deliver an incredibly pixelated experience. This puts the Galaxy Core Advance up against the Nokia Lumia 625, which has the same screen size and resolution as well as a low price tag. Inside the Galaxy Core Advance you'll find a 1.2GHz dual-core processor, 1GB of RAM, 8GB of internal storage and a microSD slot - exactly the same set up as the original. Round the back the same 5MP camera resides and you do get a single LED flash, which is new. 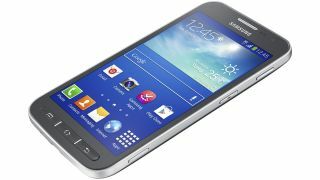 The handset runs Android 4.2 Jelly Bean but don't hold out too much hope of an Android 4.4 KitKat update - Samsung has often overlooked its budget handsets in this respect in the past. The Galaxy Core Advance does appear to be well connected however, with Wi-Fi, Bluetooth 4.0 Low Engery, GPS and NFC all onboard - there's no 4G though. Samsung has confirmed that the Galaxy Core Advance will be making it to the UK, although "availability (and price) will be announced in due course."